SUBHEAD: Bank of America, HSBC, UBS, Goldman, Wells Fargo, JPMorgan et al are in for $4billion. 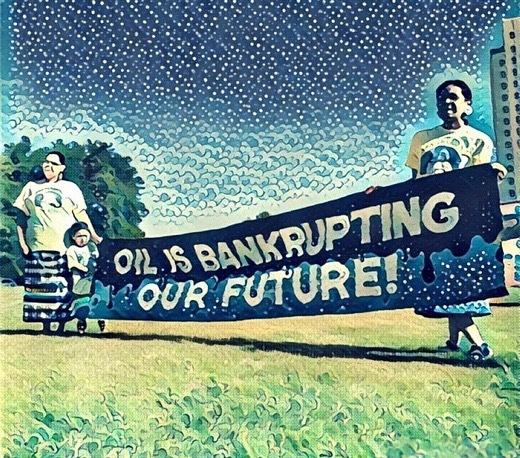 Image above: Illustration "Oil is Bankrupting Our Future" in support of indigenous rights. From (http://www.thedailycall.org/?p=92165). Over 1,000 people representing more than 100 tribes are gathered along the Cannonball River by the Standing Rock Sioux Reservation to resist the construction of the $3.8 billion Dakota Access pipeline. It’s been described as the largest unification of Native American tribes in decades. On September 3, the Dakota Access pipeline company attacked Native Americans with dogs and pepper spray as they resisted the construction of the $3.8 billion pipeline on a sacred tribal burial site. Saturday was also the first day of a two-week call for actions against the financial institutions that are bankrolling the $3.8 billion Dakota Access pipeline project. A new investigation has revealed that more than two dozen major banks and financial institutions are helping finance the Dakota Access pipeline. The investigation was published by the research outlet LittleSis. It details how Bank of America, HSBC, UBS, Goldman Sachs, Wells Fargo, JPMorgan Chase and other financial institutions have, combined, extended a $3.75 billion credit line to Energy Transfer Partners, the parent company of Dakota Access. For more, we speak with the author of this investigation, Hugh MacMillan, a senior researcher with Food & Water Watch. AMY GOODMAN: This is Democracy Now! Well, Saturday was also the first day of a two-week call for actions against the financial institutions that are bankrolling the $3.8 billion Dakota Access pipeline project. A new investigation has revealed more than two dozen major banks and financial institutions are helping finance the Dakota Access pipeline, the investigation published by the research outlet LittleSis. It details how Bank of America, HSBC, UBS, Goldman Sachs, Wells Fargo, JPMorgan Chase and other financial institutions have, combined, extended a $3.75 billion credit line to Energy Transfer Partners, the parent company of Dakota Access. For more, we’re joined by the author of the investigation, Hugh MacMillan, a senior researcher with Food & Water Watch. Hugh, you only have a minute here; we’ll continue the conversation after the show and post it. But tell us what is most significant to understand. What companies and banks are responsible for this project? HUGH MACMILLAN: Well, there’s too many to list in a minute, that’s for sure. It’s 30-plus, all told, on the order of 10 billion, that is backing the Energy Transfer family of companies. And really, this is a slice of the much larger fracking pie for these banks. These banks have succeeded in equating energy security in this country—in, more precisely, North America—with widespread fracking. And this action—you know, I think we can look forward to a history that is kind to the Sioux in helping us question whether that’s a good idea. AMY GOODMAN: Can you explain who owns the Dakota Access pipeline company and Energy Transfer Partners? HUGH MACMILLAN: Yes. So, behind this pipeline is—it’s a joint venture of joint ventures. It’s typically opaque. You have—the key players are a Energy Transfer family of companies. You have Marathon, you have Phillips 66, and you have Enbridge. Enbridge and Marathon both—both bought in just a month ago for $2 billion. AMY GOODMAN: And the banks? HUGH MACMILLAN: Well, the banks have set aside some $7.75 billion for the Energy Transfer family of companies. And through work with Rainforest Action Network, we also know that $2.5 billion has been provided specifically for this pipeline by some 17 different banks. AMY GOODMAN: Hugh MacMillan—we’re going to have to leave it there; we’ll post the rest online—of Food & Water Watch. Special thanks to Laura Gottesdiener, John Hamilton and Denis Moynihan. We continue our conversation with Hugh MacMillan on his new investigation revealing the financial institutions backing the $3.8 billion Dakota Access pipeline project. This is Part 2 of our conversation with Hugh MacMillan, a senior researcher with Food & Water Watch. AMY GOODMAN: This is Democracy Now!, democracynow.org, The War and Peace Report. I’m Amy Goodman. In North Dakota, over a thousand people representing more than a hundred tribes are gathered along the Cannonball River by the Standing Rock Sioux Reservation to resist the construction of the $3.8 billion Dakota Access pipeline. It’s been described as the largest unification of Native American tribes in decades. Well, this past weekend, on September 3rd, Labor Day weekend, the Dakota Access pipeline company attacked Native Americans with dogs and pepper spray as they resisted the construction of the $3.8 billion pipeline on a sacred tribal burial site. Also, Saturday was the first day of a two-week call for actions against the financial institutions that are bankrolling the Dakota Access pipeline project. A new investigation has revealed more than two dozen major banks and financial institutions are helping finance the DAPL, the Dakota Access pipeline. The investigation was published by the research outlet LittleSis. It details how Bank of America, HSBC, UBS, Goldman Sachs, Wells Fargo, JPMorgan Chase and other financial institutions have, combined, extended a $3.75 billion credit line to Energy Transfer Partners, the parent company of Dakota Access. For more, we’re joined by the author of this investigation, Hugh MacMillan, a senior researcher with Food & Water Watch. Hugh, welcome to Democracy Now! This is Part 2 of our conversation. Tell us what’s most important to understand about the structure of the Dakota Access pipeline company. HUGH MACMILLAN: Dakota Access, LLC, is a joint venture of Phillips 66 and a joint venture of two members of the Energy Transfer family—Energy Transfer Partners and Sunoco Logistics. Enbridge and Marathon Oil have bought into this, this joint venture. Together, they now have about a 37 percent stake in the pipeline, in the Dakota Access pipeline. AMY GOODMAN: How are the banks involved? HUGH MACMILLAN: Well, that’s—they are banking on this company and banking on being able to drill and frack for the oil to send through the pipeline over the coming decades. So they’re providing the capital for the construction of this pipeline. AMY GOODMAN: And explain what the banks are. Which banks are they? And how are they involved? HUGH MACMILLAN: Well, I’ve got a list of the 17 banks that are specifically providing financing for this project. And it’s also coupled together with a Energy Transfer—Energy Transfer Partner project to convert an existing pipeline that would connect to the south end of the Dakota Access pipeline and run oil all the way down to the Gulf Coast, where there are refineries and also export infrastructure. HUGH MACMILLAN: I can. Citibank is the bank that’s been running the books on the project, and that’s the bank that beat the bushes and got other banks to join in. So, we have Wells Fargo, BNP Paribas, SunTrust, Royal Bank of Scotland, Bank of Tokyo-Mitsubishi, Mizuho Bank, TD Securities, ABN AMRO Capital, DNB First Bank—and that’s actually a bank based in Philly; it’s not the DNB Bank based in Norway, which is actually provided several hundred million to the Energy Transfer family separately—and ICBC London, SMBC Nikko Securities and Société Générale. AMY GOODMAN: Now, it’s Citibank—is that right?—that’s running the books, as the report points out, for Energy Transfer and Sunoco Logistics, which own the Dakota Access pipeline? HUGH MACMILLAN: That’s right, by and large. So they have the largest share, and they’ve spearheaded the effort. So, what we published in LittleSis was the 30-plus banks that have provided general financing for Sunoco Logistics and Energy Transfer Partners. Through working with Rainforest Action Network, we were able to—who has access to Bloomberg Terminal, we were able to determine these 17 banks that I just listed, who are providing the direct financing for the Dakota Access project and, in addition, for an Energy Transfer Partners project to extend this pipeline on down to Texas. So, collectively, this pipeline would run from near the Canadian border on down to the Gulf Coast of Texas over 1,800 miles. AMY GOODMAN: I was just talking to an oil trucker in the plane back from North Dakota, and he trucks from the Bakken fields to other areas of North Dakota, just locally. And he said it is stunning to see the drop in demand for oil just in this past year. He has been trucking for four years. What about this decline in demand and what this will mean? HUGH MACMILLAN: Well, you know, if you ask Morgan Stanley, they said a year ago that the oil producers are getting into prison shape—and without irony. So, you know, this is a long-term—these are long-term investments from the banks. There’s fully the—they fully expect the United States to maximize its production of oil and gas through widespread fracking. AMY GOODMAN: What do you mean, "prison shape"? HUGH MACMILLAN: Well, I have a note here. They explain that "Some prisoners"—and I quote—"contrive clever equipment in workouts that result in fitness levels that surpass the traditional gym shape." And so they’re speaking in—they’re drawing an analogy to prisoners getting in good shape, drawing an analogy from that to oil and gas companies, fracking companies, learning how to do things more cheaply and more efficiently. AMY GOODMAN: So, Hugh MacMillan, as we wrap up, what do you think is most important for people to understand about the corporate structure of the company, Dakota Access pipeline, that is building the Dakota Access pipeline? HUGH MACMILLAN: Well, I think it’s important to see the forces behind this particular pipeline as the same forces behind numerous other pipelines across the country, both for—both to support fracking for tight oil as well as fracking for shale gas, all toward maximizing production of oil and gas, when the science is clear that we need to maximize what we keep in the ground. Our current policy has not made that switch. HUGH MACMILLAN: That’s right, in Oklahoma. The Quadrennial Technology Review speaks of a future mastery of the subsurface toward maximizing production. AMY GOODMAN: Well, Hugh MacMillan, I want to thank you for being with us, senior researcher at Food & Water Watch, author of the recent investigation, "Who’s Banking on the Dakota Access Pipeline?" We will link to that report at democracynow.org. I’m Amy Goodman. Thanks for joining us.